In order to understand what the best gift ideas for the elderly are, one must first understand the difficulties that they experience in their daily lives. While a lot of these challenges are associated with increased age, not all seniors may suffer from the same problems at the same time. Some well be able to maintain good health well into old age, whereas others may be affected by physical or cognitive declines much earlier in life. So let’s talk about the usual deficits and some gifts that could help seniors live more independently. Old age is typically associated with declines in one’s ability to hear different frequency ranges. As a result, many seniors begin to have difficulty with hearing face to face conversation. Luckily, this can usually be overcome with use of body language and additional visual cues. However, when one attempts to communicate on a regular telephone, it can be difficult to understand the person on the other line. While placing the phone on speaker mode can help to alleviate this problem, it does not work in all situations. A great alternative is to utilize a captioned telephone that basically transcribes what the other person is saying, allowing one to read spoken words and sentences. With adjustable font sizes and simple one touch picture dialing, seniors can boost their ability to communicate with relatives and anyone else they wish to call. Aging is associated with many visual disorders that affect sight. At an anatomical level, the ciliary muscles that control the adjustable lens in our eye become weak over time. This leads to a slow deterioration of fine details as the lens becomes less flexible and is a leading contributor to difficulty with reading small print. Thus, it makes perfect sense to give the gift of vision to that senior in your life. A magnifying glass with built in LED light will allow seniors to read the newspaper or the small font on many medication bottles. This allows seniors to be less reliant on family members for reading, and is a relatively inexpensive purchase that can help in many situations. Using a tub transfer bench is one of the safest ways to get in and out of a bathtub. One of the most common areas where seniors fall is during bathing. It is well known the wet floors in combination with any balance impairment (something that affects many seniors) is a recipe for disaster. Using a tub transfer bench, which sits partially inside and partially outside the tub allows the individual to sit on the edge of the device and turn their body to bring their legs into the tub. With this transfer aid, there is a significantly lower risk of falling because the transfer can be completely done from a seated position. In contrast, standing and balancing on one foot while lifting the other over the tub threshold is a risky maneuver for many seniors. 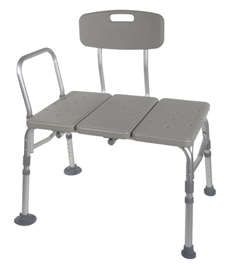 Without a tub transfer bench, it is likely that hands on assistance from family or a personal support worker is required to reduce the risk of falling. In essence, this easy to use device makes bathing more safe and allows seniors to be more independent. The arms of a toilet safety frame can be pushed on to gather the momentum needed to stand up. Everyone must use the toilet on a daily basis. However, most homes have toilets that were put in many years ago and are poorly designed to support seniors. For example, toilets seats that are less than 16 inches off the ground are considered too low in most cases. While this height may be okay for some very short people, it is not suited for most elderly individuals. Having a low toilet means that one requires more strength and endurance to get into standing and sometimes the lower body does not have the ability to support such a dramatic change in posture. There exist raised toilet seats to increase the seat height, however this is not the most popular toilet aid because they are often poorly secured and have poor visual appeal. 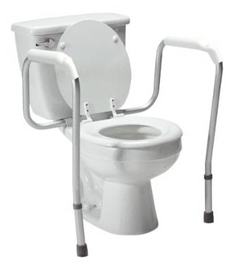 With the use of a toilet safety frame, which can be easily screwed into the toilet seat hinge, seniors can more effectively get up and stand from a low toilet. The toilet safety frame, also known as a versaframe, essentially provides two arms that can be pushed on to help one get into standing. Unlike grab bars that can sometimes be located in awkward positions or too far away, a toilet safety frame is always nearby and accessible as it is connected to the toilet bowl itself. One added bonus of this assistive device is that it can also help the elderly with decreased vision by cueing them to where the toilet is located. With a screw driver, almost anyone can install and secure this device into place. 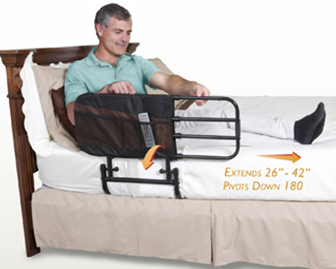 An adjustable bedrail can be used to help pull oneself to the edge of the bed, and even to push on to get into standing. Finally, many seniors have difficulty with getting out of bed. This is not surprising as some mattresses tend to sink under one’s weight and place the individual within a groove. Also, it is important to note that the act of moving one’s weight from a lying down position to sitting at the edge of the bed, and then into standing can be quite demanding of one’s energy. This trouble often surfaces after a recent hospital admission or illness that leaves a senior weak or deconditioned. Thankfully, with the use of an adjustable bedrail, the elderly can take advantage of their existing upper body strength to gather the required momentum for position changes and to help with getting out of bed. Most bedrails slide underneath the mattress and are secured in place with a board or strap. With the railing placed near the head of the bed, one can pull on the railing to move from a lying down position to sitting at the edge of the bed. From there, one can also push off the railing to support oneself into a standing position. There are many different kinds of bedrails out there, including portable travel size versions for seniors that spend a large part of their time in foreign places and hotels. As we age, our tolerance for walking becomes lower and lower. This can be visible in seniors that tend to want to rest after short periods of ambulation, hang onto nearby objects or furniture for support when walking, and those that experience shortness of breath with mobility. That said, more often than not, it is the occurrence of a fall that prompts most seniors to explore the use of a mobility device to support their walking. 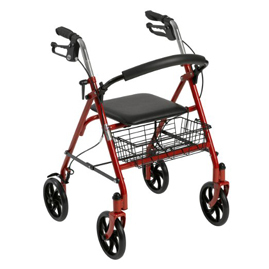 Aside from a cane, the most common mobility aid is a rollator walker with four large 6-8 inch sized wheels and a built in seat to allow periodic rest breaks. Most walkers also come with a basket to allow storage of a few important items such as groceries or cellular phones. This device basically expands the user’s base of support to improve their balance, and allows them to walk further distances. This is a must have device for many seniors that have difficulty with walking and normally require hand in hand support with this activity. It should be noted that learning to utilize the brakes is pivotal to one’s safety and improper use can actually lead to more falls or injuries. For this reason, it is important that a physiotherapist or occupational therapist assess your mobility needs before recommending the most appropriately sized walker for you. During the process, these healthcare providers can also provide training on appropriate walker usage and provide tips on how to minimize fall risks with safe usage strategies. A medication aid that rings when one needs to take their pills. Minimizes medication errors and improves compliance. You may find with older age that your mind tends to slip and miss a few details. Normally it is okay if you forget the occasional name, but when you forget to take your medication, you are at risk of severe consequences. For instance, if one is on blood thinners, but neglects to take their medication as prescribed, you could be at risk of developing a blood clot or having a cerebral vascular accident. 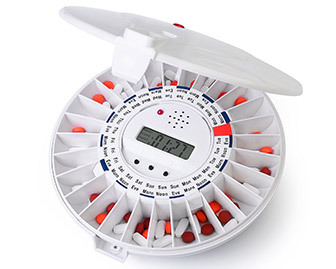 With the use of an automatic pill dispenser, you will be reminded when to take your medications with an alarm and the medications will be presented to you to take. This device is great for any senior that have multiple medications and are at risk of forgetting whether they have taken them already (and potentially double dosing) or totally forgetting to take them at all from regular pill bottles. With this memory aid, one has a more effective means of tracking what medications were already taken and there are less errors to be made when the device is organized carefully.